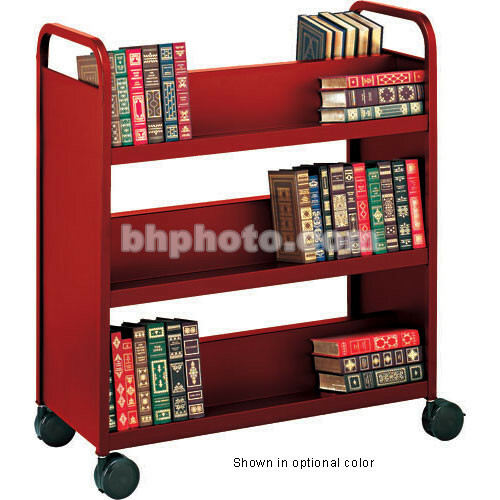 The Bretford BOOV1-RN Double-Sided Mobile Book & Utility Truck has three double-sided slant shelves that provide ample space for books, binders, audio or video tapes, and reference materials. Its contemporary styling features smooth rounded handles that are built into the end panels and 4" black twin wheel designer casters. Combining durable all-steel construction with shelves that are arc welded into place for maximum strength, the BOOV1-RN is finished in environmentally-friendly Raven powder paint. Box Dimensions (LxWxH) 46.0 x 41.0 x 21.0"